Thanks for visiting today. The Style not Age ladies are sharing their latest collection today. I've only recently jumped on the gingham bandwagon, therefore have only got two items in my wardrobe. 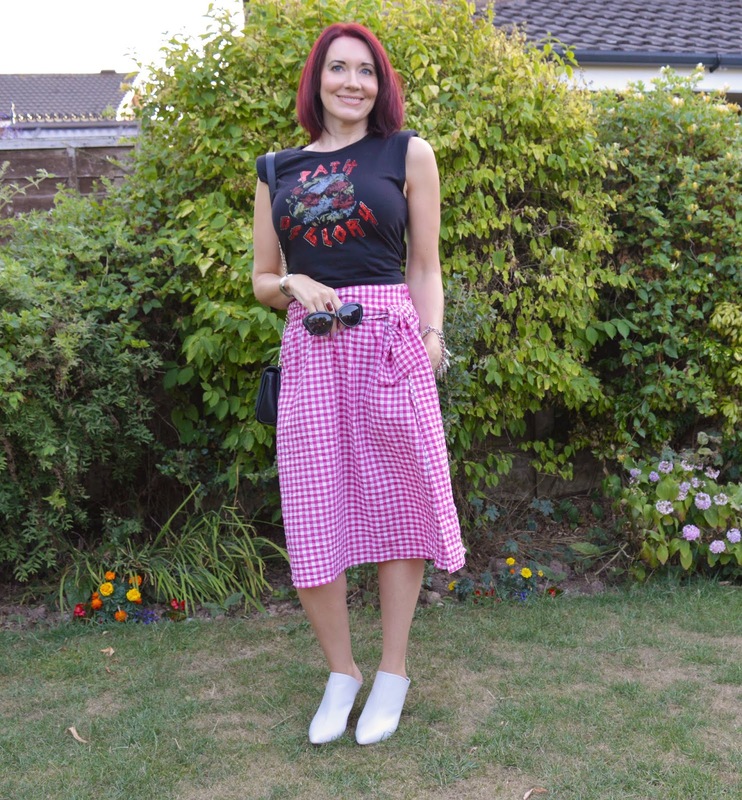 You may well remember seeing three ways with my gingham crops - which I absolutely love. I also have a rather easy wearing cold shoulder top too! With so much happening at the moment I've had no time for shopping! - I know you're shocked lol! So I set about creating my look from my wardrobe. I settled on the crops, having not worn them for a while because of the heatwave & I'd forgotten just how much I liked wearing them. I fancied having another go at pattern mixing so hung a few bits together to see if it worked. Abandoning my often dullish dressing & going with a big pattern mix-up today. Seeing florals and squares matching on other bloggers I figured it might be my turn, squaring up to the challenge in more ways than one. Rather than wear a black or white tee I picked mustard which is on the leaves of my sleeveless over-shirt. I saw this shirt in Matalan a few years ago. The big bold flowers caught my eye and I couldn't resist buying it. I'm enjoying the freedom that mixing designs can do, and hope this will grow and grow in the future. Let's have a look at how Hilda, Anna and Emma have faired with this challenge. Hilda set July's challenge. I love how we often 'twin' with our choices Hilda - both choosing gingham trousers this month! I'm also dotty about the spotty shirt too! Find more on Hilda's blog Over the Hilda. Anna can be found nestling in sunny Tresco. You can read more about her life and fashion over on her blog Anna's Island Style. 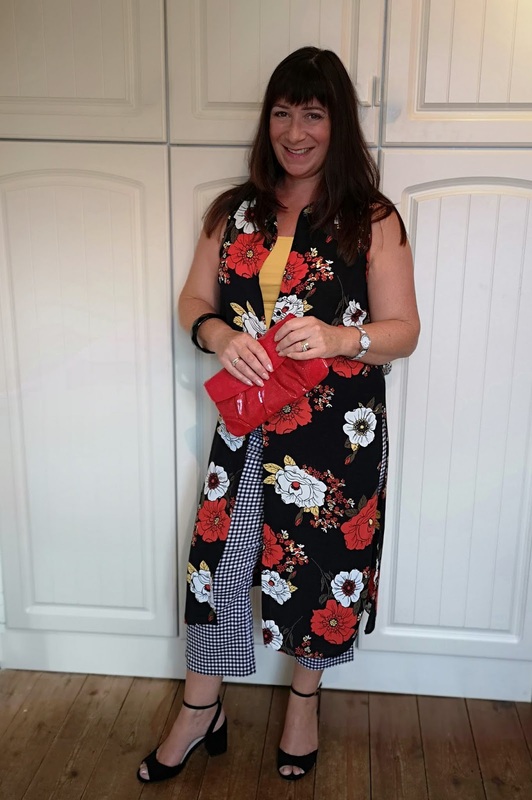 Here she shows us what she does best and I get lots of confidence from Anna's pattern mixing. 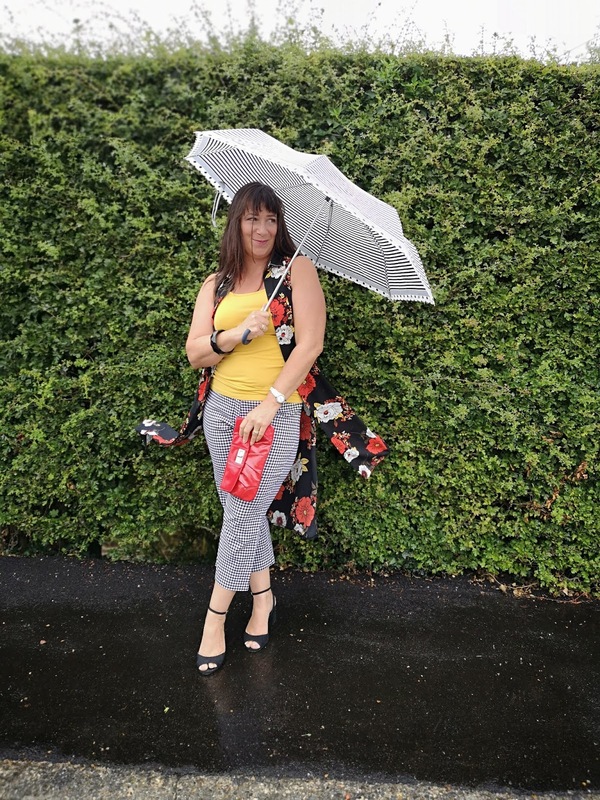 Emma who's blog is Style Splash has opted for a pretty red Zara skirt, topped off with her graphic tee shirt, I love the mix of dainty and feminine with bold and rocky. Well we certainly proving we're 'Not square with Gingham' this month with our well rounded & refreshing outfits! Are you a fan of gingham? It seems to come in and out of fashion nearly every year, and has been around for as long as I can remember. Glad you could join me today, I love hearing from you - so please leave me a comment. You've done brilliantly with this one Jacqui! The red in the overshirt looks sensational with the ochre of your top, and the overshirt looks fantastic against the gingham! Absolutely gorgeous, Jacqui! 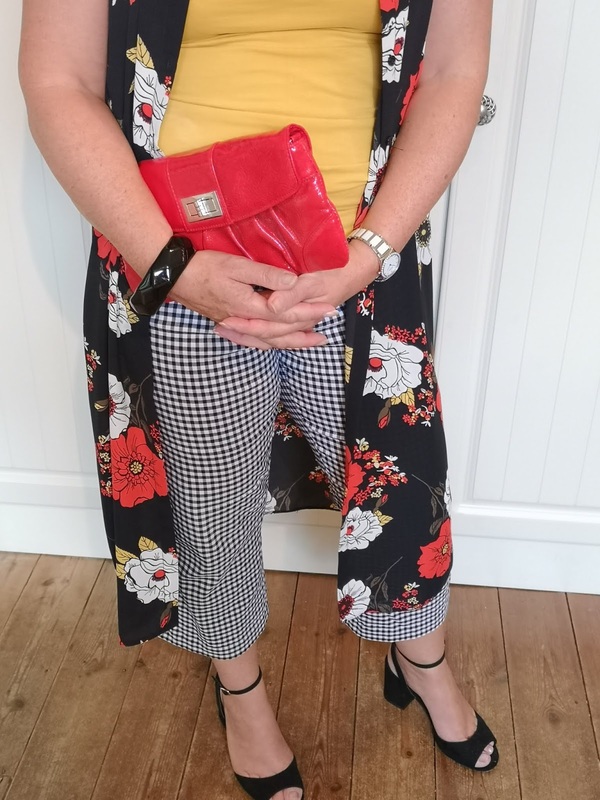 I love the pattern mixing – it really works! And that umbrella is fabulous too! Jacqui, I adore this look! I love gingham and floral together. And while I usually don’t like red and yellow together, you have paired the two colors together magnificently! And that umbrella is way too cute! I love these photos...you look like you are having so much fun. Great post! Great photos Jacqui! 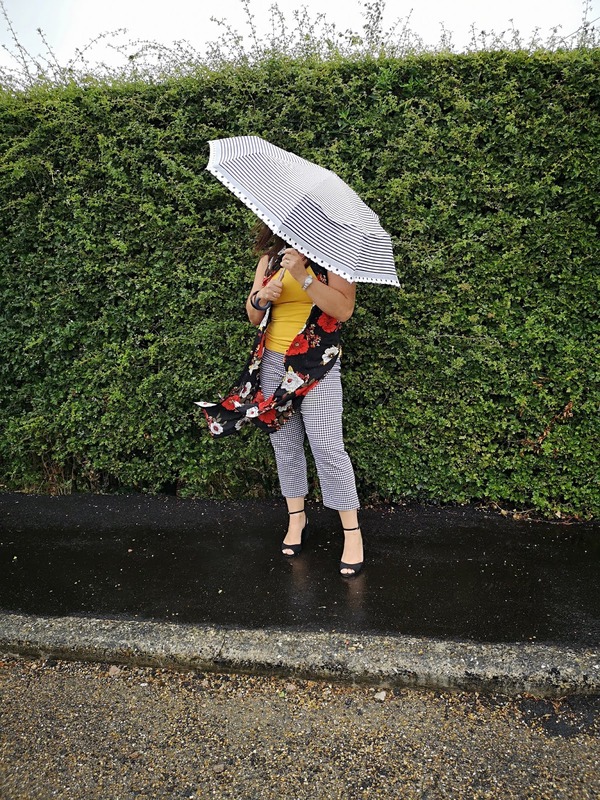 I love how you've made a feature of the umbrella and had fun with the rain! Fabulous pattern mixing too! 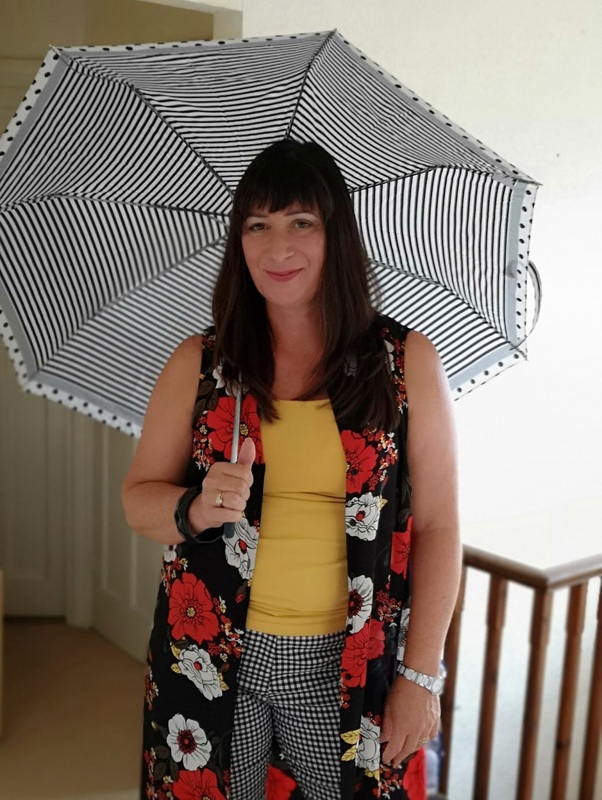 A great bit of pattern play here Jacqui with this fabulous floral overshirt. 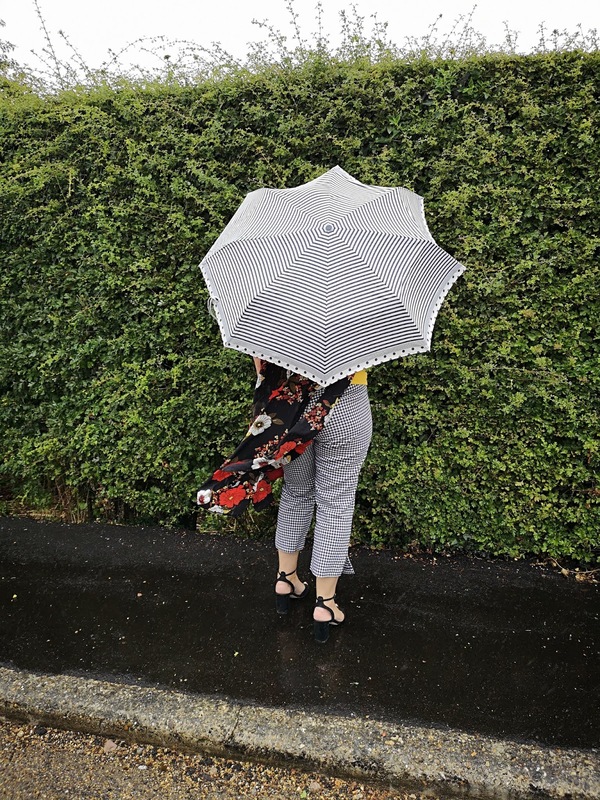 I can see now that your brolly is striped not checked as I'd thought - no matter, it all looks such fun with these colours working so well together. Another successful challenge I'd say! I really need trousers like that! Why haven't I got a pair?? 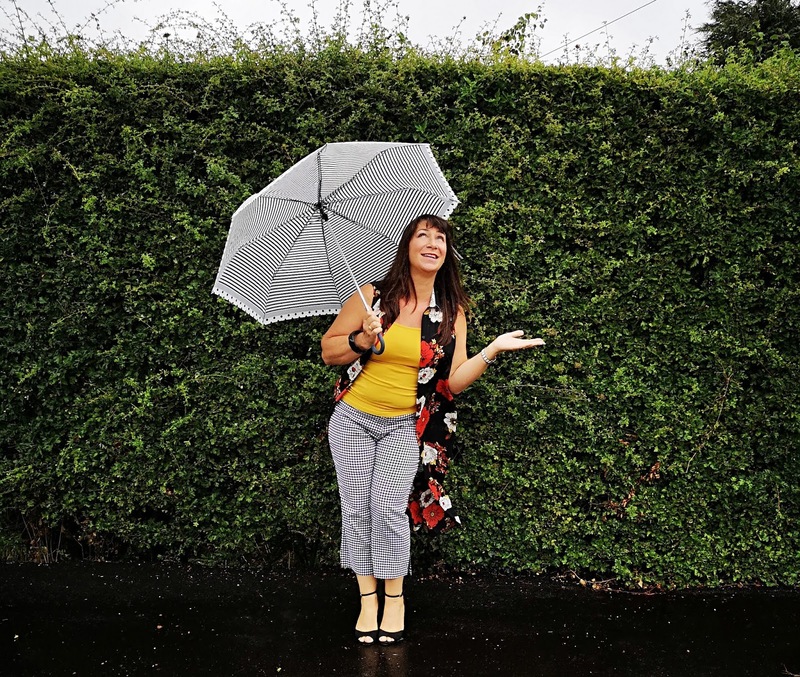 Jacqui you look fantastic and I just love the fun photos in the rain. 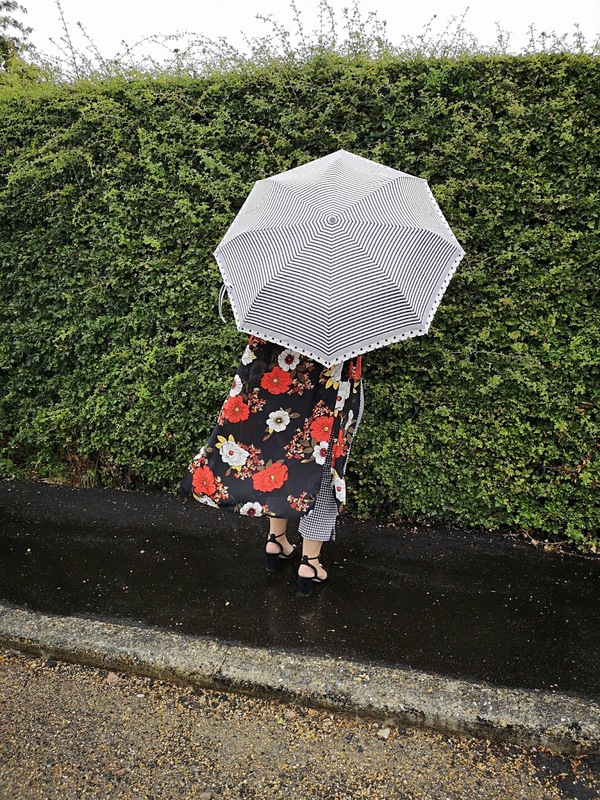 loving the gingham and the floral and that umbrella played an important part too. Lovely pictures Jacqui. 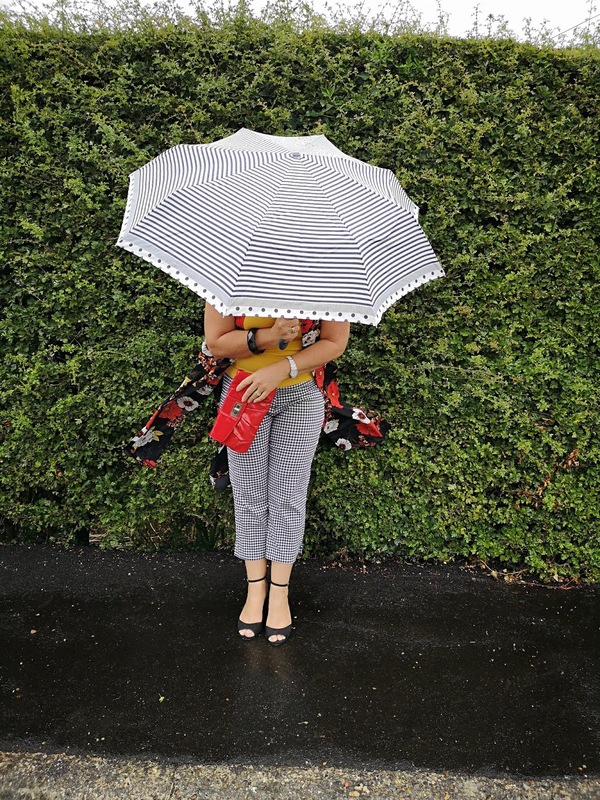 Love your gingham trousers and your fab umbrella :) Thanks for sharing at Creative Mondays. Have a lovely weekend.